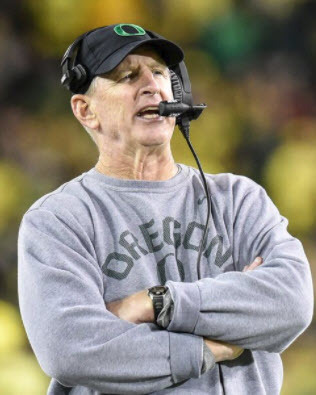 Now that we have covered the general structure and defensive fronts used by Oregon defensive coordinator Jim Leavitt, we will begin delving into his coverage schemes in the next several posts. In this analysis, we will be exclusively featuring his triangle coverages: 3 defender over 2 receiver coverage concepts. (The inside “receiver” here can be either a slot receiver or a tight end.) Jim Leavitt only runs triangle coverages with two (2) deep safeties. Jim Leavitt appeared to run only three triangle coverages in 2017: Quarters, Two-Read, and Halves. But he does have the ability to run any one of the three coverages to either side of the field. 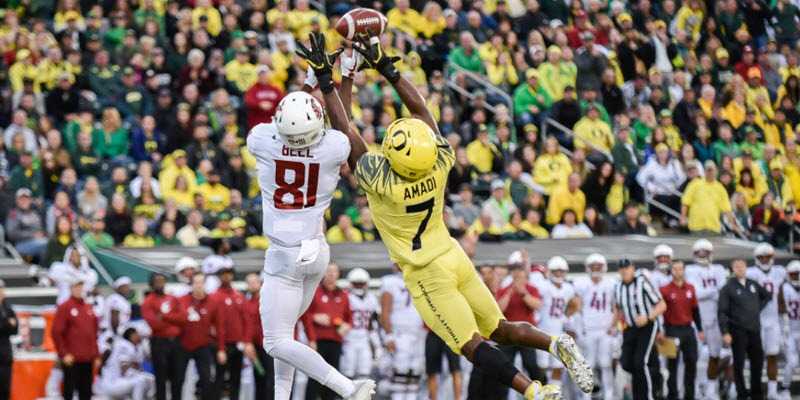 All three involve the cornerbacks largely in a in up close press-alignment, which can make it difficult at times for opposing quarterbacks to discern Oregon’s exact coverage at pre-snap. Leavitt’s calls for which outside linebacker will be rushing appears to be based primarily on lining up in a field/boundary location call as opposed to a strong/weak formation. 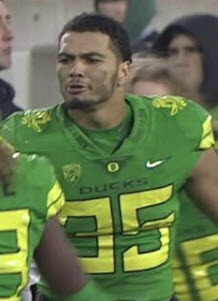 What I mean is that when the pressure is set, the pressure is set – a man in motion by the opposing offense will not change the Ducks designated rusher. In addition, Leavitt will not push his inside linebackers out of the box to make the coverage work. So against change of strength motions, (above) the coverage will frequently change. So, for example, if the boundary outside linebacker is rushing and the offense motions to trips into the boundary, then Leavitt will simply roll into Cover 3 rather than changing the designated rusher. The term “Quarters coverage” is confusingly denoted to describe both: (i) a family of related pattern match coverages that adjust who “matches” depending on the route of the No. 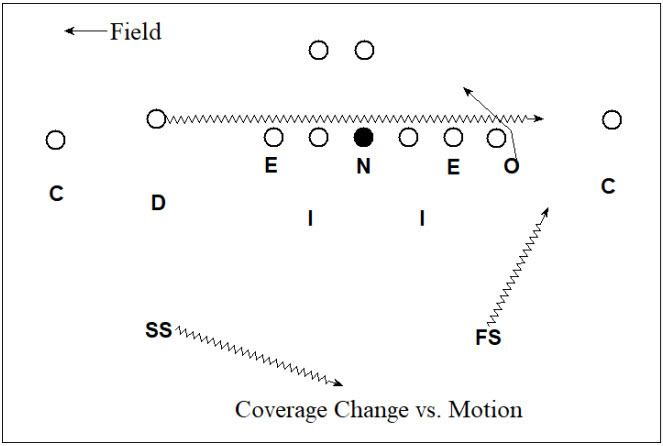 2 receiver, and (ii) the most commonly used form of those coverages, both in college and in the NFL. I am going to be using the latter definition in this article. “Quarters coverage” often goes by other names – some coaches might call it Sky, Nick Saban calls it Mod – but it always follows the same rules. Brady Breeze is learning the safety coverages. Corner – The corner will be in man-to-man coverage on all No. 1 receiver routes, except when No. 1 breaks at 5 yards or less (e.g., shallow, 5 yard hitch). If No. 1 breaks at 5 yards or less, the corner’s coverage is zone to deep quarter. OLB/ILB – Takes the first man coming into the flat. E.g., No. 1 receiver if he runs a 5 yard hitch, No. 2 receiver if he runs an out or bubble route, or No. 3 if the running back swings to the flat, etc. If the No. 2 receiver begins to go vertical, always reroute No. 2 receiver before breaking to cover the first man to the flat. Safety – Take all of No. 2 receiver vertical. If No. 2 receiver is not vertical, then bracket No.1 receiver. –If Two-Read or Halves to opposite side: Take any No. 3 that will not be covered by the Corner, OLB/ILB, or Safety to that side, but in no case shall you cover anything within the first 5 yards of the line of scrimmage. Otherwise, defend the hook area deep to short. 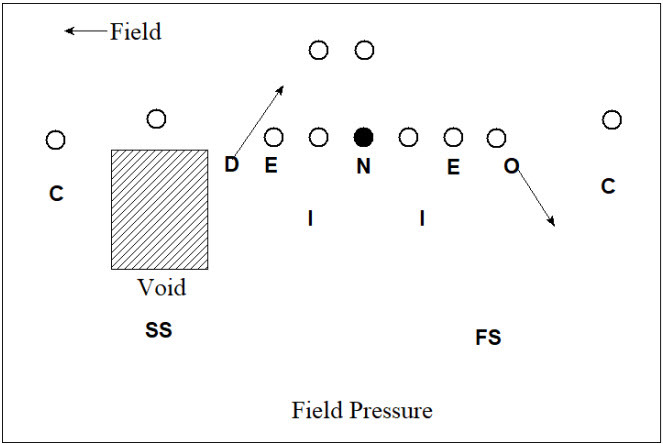 –If Quarters to opposite side: Man defense on No. 3 receiver if he threatens to go beyond the first 5 yards of the line of scrimmage. Otherwise, defend the hook area deep to short. 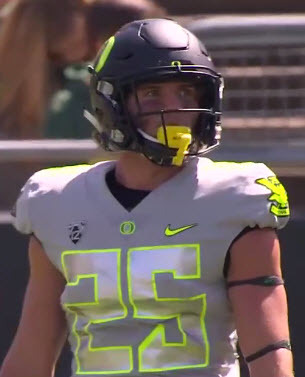 Leavitt will run Quarters to both the field and to the boundary on nearly every down and distance, though it is his most common coverage to the field out of two-high. Leavitt will, on occasion, (above) appear to run Quarters to the field side even when the field outside linebacker is rushing. This frequently leaves a massive void for any short route to the No. 2 receiver wide open, though Pac-12 offenses capitalized on this gift less than I expected. Admittedly, however, when facing a wide receiver and slot receiver to the field with the field outside linebacker rushing, Leavitt more commonly ran 2-Read coverage. The 2-Read coverage follows all the same rules as Quarters coverage, except when the No. 2 receiver is out in the first 5 yards. When that happens, the corner will take the No. 2 receiver as he goes out, and the safety will cover the No. 1 receiver. If the No. 2 receiver does not go out in the first 5 yards, however, it will operate by all the same rules as Quarters. –No. 2 receiver is out in first 5 yards, then take No. 2. –No. 1 receiver breaks at 5 yards or less (e.g., shallow, 5 yard hitch), then take zone to deep quarter. OLB/ILB – Man on No. 2 except when No. 2 is out in first 5 yards. Then relate to No. 3. If there is no No. 3 receiver, then defend the hook. You do not have No. 2 receiver vertical. Safety – Take No. 1 receiver vertical if No. 2 is out in first 5 yards. Otherwise, take all of No. 2 receiver vertical. If No. 2 is not vertical, then bracket No. 1. ILB – Take any No. 3 receiver that will not be covered by the Corner, OLB/ILB, or Safety to that side, but in no case shall you cover anything within the first 5 yards of the line of scrimmage. Otherwise, defend the hook area deep to short. “Halves coverage” is a pattern-match Cover 2 coverage. The corner will always remain down in the flat, and the safety and OLB/ILB will match up on all the routes that do not end up in the flat. Corner – Align with an inside eye into backfield. Take the first man to the flat. E.g., No. 1 receiver if he runs a 5 yard hitch, No. 2 if runs the out or bubble route, No. 3 if the (running back swings to the flat, etc. OLB/ILB – If No. 3 receiver releases to your side, then man defense on No. 2 for everything. If No. 3 does not release to your side, then man on No. 2 for everything except when No. 2 receiver goes out to the flat, and then rob the No. 1 (since the safety is over the top, think interception or pass deflection). Safety – Take all of No. 1 receiver vertical. If No. 1 is not vertical, then bracket No. 2. ILB – Take any No. 3 that will not be covered by the Corner, OLB/ILB, or Safety to that side, but in no case shall you cover anything within the first 5 yards of the line of scrimmage. Otherwise, defend the hook area deep to short. Leavitt seems to only run Halves to the field against a tight end and flanker (and it wasn’t that often even then), but primarily into the boundary, looking to involve the corner in short-side run support. 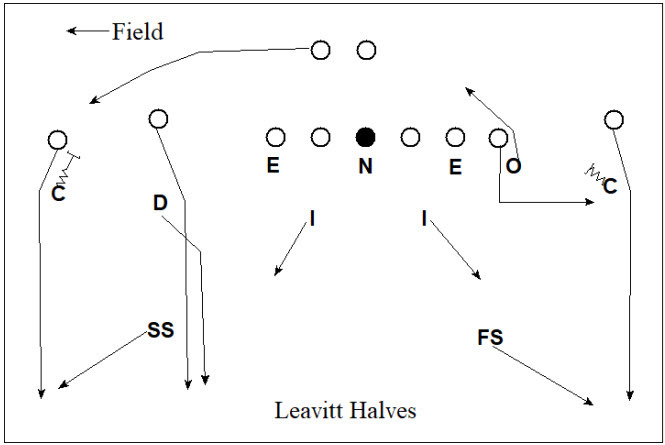 So against run-heavy offenses, Leavitt ran mostly 1-high coverage or Halves into the boundary side of the field. 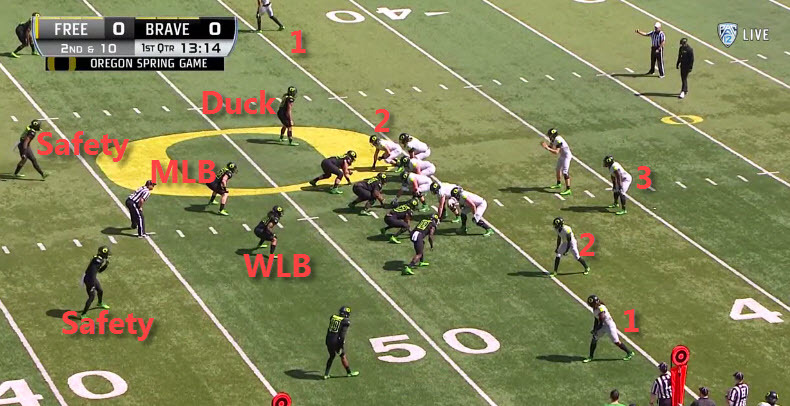 So as you can see above, the Ducks have a variety of ways of covering 2 receiver sets depending on what the offense is threatening. 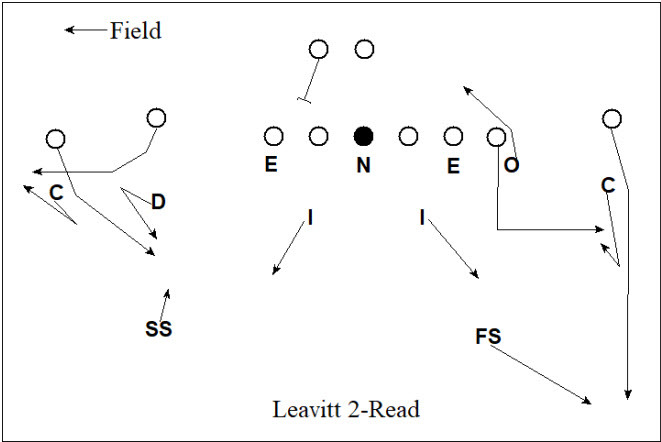 So if the offense is running a lot of bubble routes to the field, Leavitt can 2-Read. 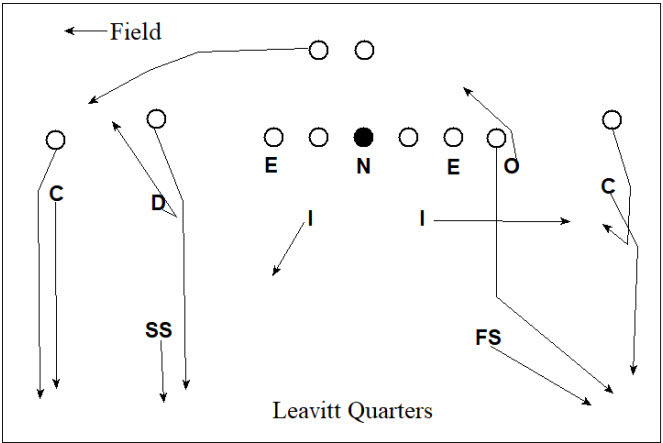 Or if the offense is running a lot into the boundary, Leavitt can run Halves. It gives Leavitt the ability to be multiple while keeping his coverages (relatively) simple.